The house is coming along! Yesterday, the moving company hauled away a mountain of packing materials and things are starting to feel more normal, more homey. Our mattress is on the floor, but I'm pulling clothes from a dresser drawer every morning, so that's a step in the right direction! 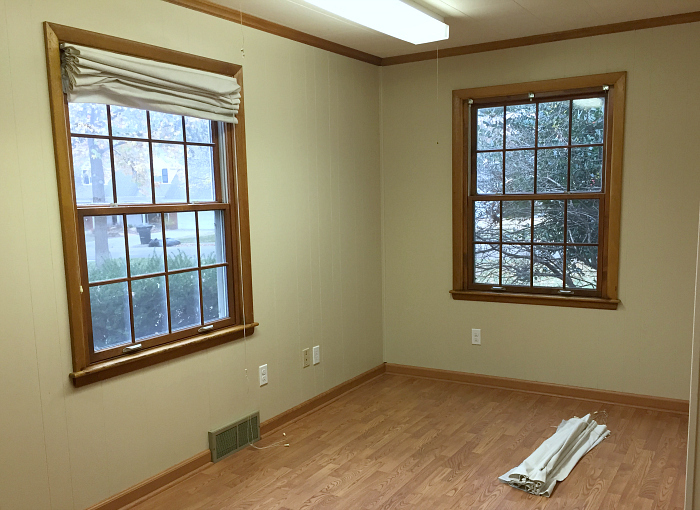 We have a couple small projects going, but we've been concentrating on the office since it needed the most help. Jesse was pretty set on tearing the room down to the studs, I think it was just hard for him to see past the job trailer-ish ceiling tiles, laminate floor and fluorescent lights. However, since we have a costly asbestos removal project slated for the summer, I wanted to try giving the room an inexpensive spruce up. It won't be anything fancy, but I guarantee it will be an improvement! Along with a spot for an office desk, we plan to make a "snug" little corner for reading and watching TV. 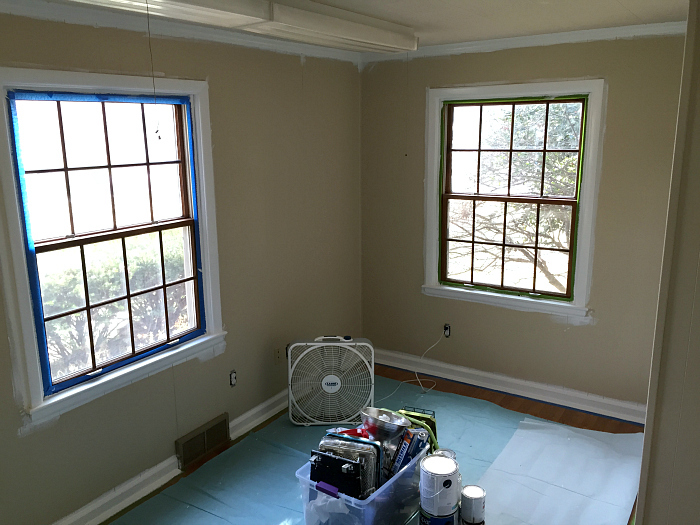 First, I caulked all the gaps between the trim and walls, then we primed and painted the trim with several coats of high gloss white paint. We painted the walls with light gray satin (pictured below) that, honestly, I'm a little on the fence about it. I feel like the color has a slight green undertone in certain light. Jesse thinks it's in my head, but I'm not convinced. Right now, it's not bugging me enough to warrant re-painting so I guess we'll see how I feel about it in a few weeks. 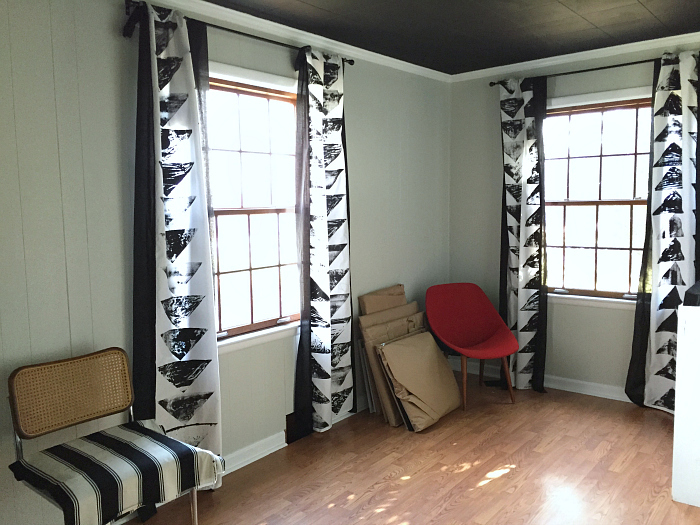 Jesse removed the fluorescent ceiling lights and patched the holes, then I painted the ceiling matte black. They definitely aren't for every room, but I love black ceilings! We painted our basement ceiling black at our old house and I was amazed at how it actually made the room feel taller. 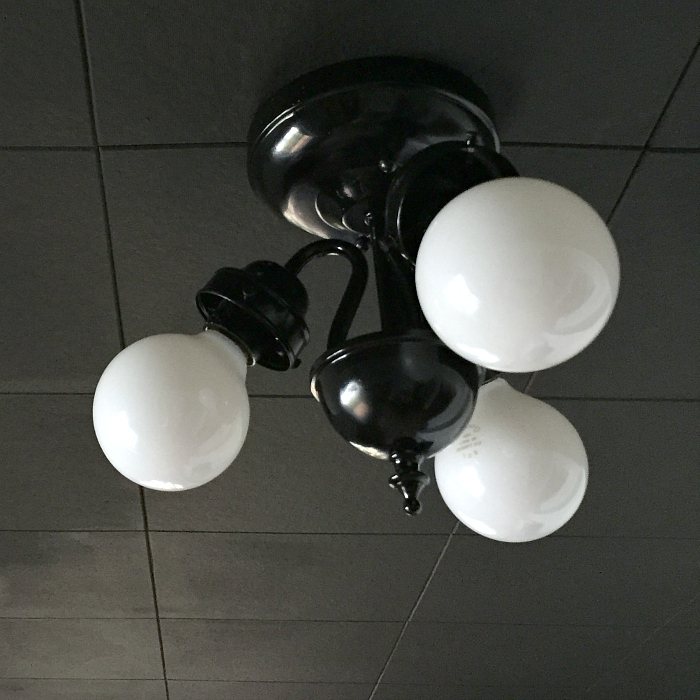 For a light, we used a 90's-ish brass fixture I found at the ReStore and spray painted gloss black. I want to paint the interior of the windows black, but I think it would be smart to wait until spring when I can take them out completely. For the window coverings, I spray painted a pair of curtain rods from our old house and I'm also re-purposing the hand stamped curtains I made last fall. Next up: Painting our desk and book shelf, mounting a small TV to the wall and finding a cozy lounge chair for the corner. Oh, and we need to re-wire and hang a pendant light I found at the ReStore, too!